Confirmed participants include Diana Agrest, Stan Allen, Amale Andraos, Harry Cobb, Peggy Deamer, Elizabeth Diller, Steven Holl, Sanford Kwinter, Thom Mayne, Daniel Libeskind, Joan Ockman, Spyridon Papapetros, Brett Steele, Nader Tehrani, Bernard Tschumi, Anthony Vidler, Rafael Viñoly, Mark Wigley, and James Wines. Each speaker will present an architecture book published in the last thirty five years that they consider to be fundamental to the understanding of contemporary architecture culture, as well as a "book yet to be written." As part of the event, Storefront will present BOOKS-NOW, a selection of signed architecture books published over the last year. Books will be on sale at a special discounted rate. 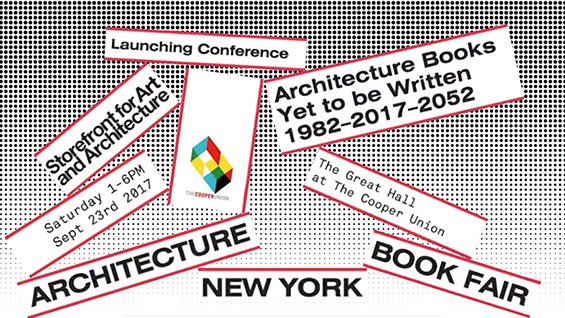 Read more about this event and the New York Architecture Book Fair here.